AP Inter Board To be Introduced Grading System Instead of Ranking (Marks): Andhra Pradesh Board of Intermediate (BIEAP) has decided to implement grading system in AP Intermediate 1st year and 2nd year examinations 2018. In spite of the ranking system, the BIEAP is planning to bring the grading system from 2018 onwards. Commissioner, Board of Intermediate Education B. Udaya Lakshmi has said on Thursday, 28th December about the awareness of implementing the grading system. The AP Board of Intermediate is planning to reduce the burden by dismissing the ranking system (marks). Recently, 4 students of Intermediate have committed the suicide due to overstress. 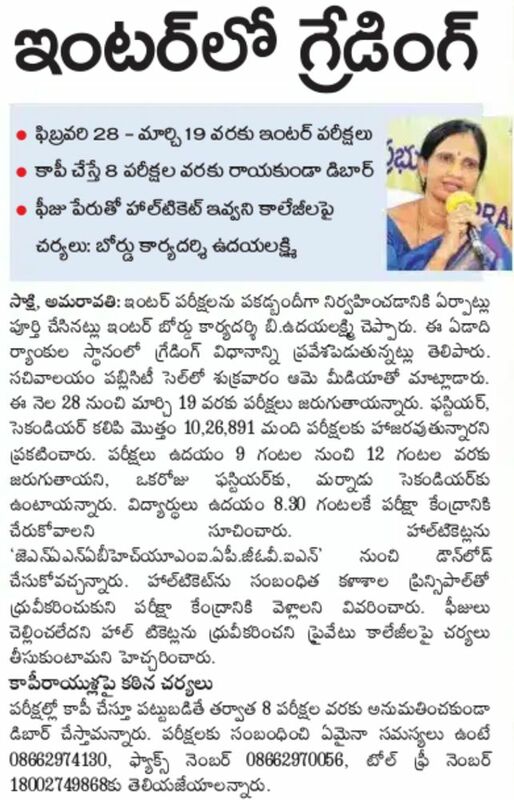 The Chine of suicides of Narayana and Chaitanya Jr College students will be reviewed by CM N Chandrababu Naidu, Udaya Lakshmi has advised that the corporate colleges must stop the corporate system and to view the stress of students. Every college in the form of government colleges should advocate sports and cultural activities and give the opportunity to speak with parents. Counselling and yoga classes are suggested for students with psychologists in each college. The students asked to complain to the Toll-free No. 18002749868 on the colleges that violated the provisions. On Thursday, 28th December, the awareness program has been conducted for the government, aided and corporate college principals in Chittoor district. In This Meeting, B Udaya Lakshmi has expressed that till now she has claimed 60 complaints from the students. The inquiries will be made on these grounds. Recently, the BIEAP has announced the AP Jr. Inter and Sr. Inter Time Table 2018 for the students presently undergoing their education under the board. As per the scheduled time table AP Inter 1st year examinations will be held from 28th February to March 17th and the AP 2nd year examinations will be conducted from 1st March to 19th March 2018. Students can refresh the exam dates once more by observing the AP Jr Iner and Sr Inter Time Tables 2018 provided here.